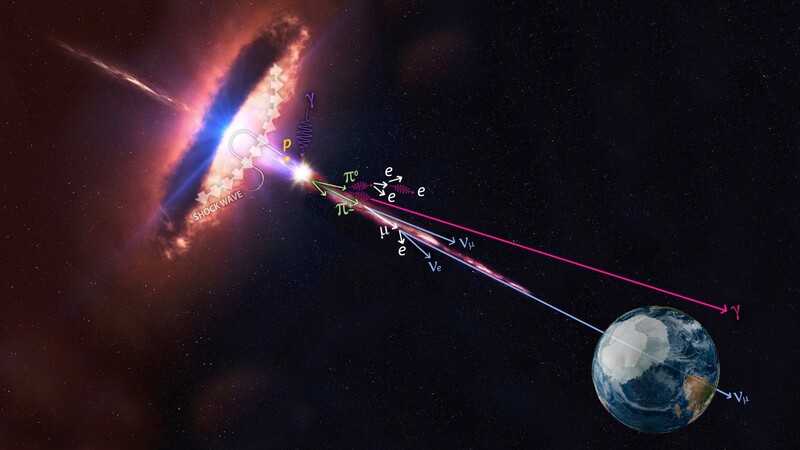 An array of detectors buried under a half-mile-wide stretch of Antarctic ice has traced the path of a single neutrino back to a supermassive black hole in a faraway galaxy, shedding light on a century-old cosmic ray mystery in the process. The discovery, revealed today in a flurry of research papers published by the journal Science and The Astrophysical Journal, marks a milestone for the IceCube Neutrino Observatory at the National Science Foundation’s Amundsen-Scott South Pole Station. It also marks a milestone for an observational frontier known as multi-messenger astrophysics, which takes advantage of multiple observatories looking at the sky in different ways. Thanks to IceCube’s alert, more than a dozen telescopes were able to triangulate on the neutrino’s source. “No one telescope could have done this by themselves,” said IceCube lead scientist Francis Halzen, a physics professor at the University of Wisconsin at Madison. This entry was posted in GeekWire and tagged Black Holes, Cosmology, Galaxies, IceCube, Neutrinos, Space. Bookmark the permalink.